The horizon is a flaming, burnished orange. The air is crisp and fresh, with a hint of chill. The trees, mostly teak and rosewood, seem to be reaching out to the sky. It had drizzled a short while ago, and the wet earth emits a lovely fragrance. At the cusp of day and night, the forest is perfectly still, that rare moment when all of nature is in harmony, a reminder of what the earth was meant to be. We come to a halt too. How I wish we could lose the jeep and stroll around instead. But never mind a stroll, even alighting from the vehicle isn’t permitted. But the risk of getting down from the jeep during the safari, I gather, would have been minimal. A tiger hasn’t been seen here for months, and the last leopard sighting was weeks ago. We are stopped by a jungle patrol, and what we think will be an interrogation turns out to be a plea to report sightings. But then, we had been warned: This was not the season, we would be lucky if we caught sight of an elephant or two. If animals are the principal attraction, it is best to make the trip in summer. The predators roam alone, but there is a good chance of encountering elephants in large herds. In winter, you gamble on their whims. Chandru, our stocky and cheerful guide who describes himself as a naturalist, tells us that more than 30 elephants were sighted the previous week. Today, the count has been one, but even that has eluded us. Though my wife is convinced that she can smell a predator—don’t ask me how—gaurs (bison) are the closest we get to the wild variety. We are alerted to their presence by a returning group, and we speed down to find that almost all the safari vehicles have converged at a point where a bunch of defiant gaurs have blocked the path. They don’t look very different from buffaloes, but they are distinctly more muscular, and have sharper horns. And there’s something fierce about their gaze. I peer out of the jeep and begin to click away, paying no attention to my wife repeatedly tugging at my shorts. She later tells me she has seen them described on the Discovery Channel as the fifth most dangerous wild animals. For me, safety lies in ignorance. On our way back, we spot a couple of jungle fowl and an obstinate jungle owl, which refuses to budge from the middle of the road. We return wiser. A safari is not necessarily about spotting animals; just the ride is well worth it. It is a theme that recurs over our short break. We had arrived in Kabini the day before, exhausted both in mind and body. What we had reckoned would be a pleasant five-hour drive had turned out to be nearly twice as long. It began with a puncture halfway through our journey. We then travelled 50km in the wrong direction and when we turned around, we discovered the spare tyre had gone flat too. So we waited for what seemed like forever as the driver hitched a ride on a truck and went off in search of a service station. We had the option of going all the way back to Mysore or braving a 50km village road to save us the extra travel. We chose the unknown and soon knew that we had picked the wrong vehicle. I had been persuaded by the owner of the travel company to rent a car instead of an SUV. “Why go in a lorry, sir,’’ he had asked, “when you can take a car?" The last mile always feels the longest: In this case, it was 15km of a zigzag mud track masquerading as a road. But, within a few minutes of checking in to Water Woods, a home stay resort I had only seen online, it was clear why it was better that way. If Kabini is about reuniting with nature and getting reacquainted with the soul, well, bad roads are a small price to pay to keep noisy tourists away. The backwaters of Kabini river—a tributary of the Cauvery—encircle Nagarhole. Heavy, unseasonal rains have flooded the banks, which is a blessing because it grants us the luxury of dipping our feet in water while we are served fresh-cooked, home-style food. There are just five rooms, and the only other guests there are a couple and their young son. The resort offers a boat safari too. But the boat’s engine has malfunctioned, and they are waiting for a mechanic to arrive from Kerala. It turns out to be a boon. We spot a couple of fishermen in a small boat in the distance and Anand, our co-occupant, manages to catch their attention. They are rowing a coracle, a small basket-shaped boat woven out of strips of wood. It looks too flimsy even for two people. Three of us join them. “The water is 120ft deep in the middle," my son tells us. “It makes no difference if it is 120ft or 12ft to someone who can’t swim," I reply. We needn’t have worried. We lie back as the fishermen take turns to navigate with deft, criss-cross strokes. It is my wife’s birthday, so we stop by the shallows to pluck some lilies for a bouquet. We anchor the boat near a field while one of them runs out promising to bring back some fruit. He returns with three ripe, juicy watermelons. I resist the temptation to gift one of them to my wife. “You shouldn’t have brought me here," my teenage son says as we are leaving. He enjoyed the safari and boat ride, but not much else. “This place is too romantic, and I’m too young for it. I will be back here a few years later, with my girlfriend." I hope to be back sooner. 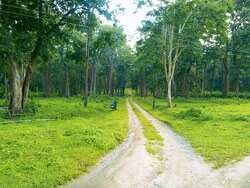 Kabini is 220km from Bangalore, and the drive—save the last 15km—is mostly pleasant. You have the option of driving down from Mysore, which is well connected to Bangalore by train. It is only a 90-minute drive from Mysore. March to May is the best for animal sighting. But since most resorts rely on solar power and generators, air conditioning is not always guaranteed. November to February is far more pleasant. Kabini offers four options; the state-run Kabini River Lodge (www.junglelodges.com/resort_overview.asp?resort=Kabini) has the best location/spread. They offer rooms, tented cottages and cottages ranging from Rs2,750 to Rs3,700 per person per night, all-inclusive. Water Woods (www.nivalink.com/waterwoods/index.html) is a cosy home stay, with five of the four rooms overlooking the water. The food is good, as is the service, and it costs Rs6,500 per couple per night. The Cicada Kabini (www.cicadaresorts.com/ kabini.html) is a traditional resort-style hotel with a pool, gym, spa and conference hall, and a daily tariff of Rs10,000, plus tax, for a standard room, while Orange County (www.trailsindia.com/resorts.asp?Resort_ID=16) has tribal-style huts upwards of Rs14,450. Safaris are obvious. Each resort offers two options, jeep and boat, and both are recommended. Take the boat safari in the morning, when the sun is mellow, but don’t expect to catch too many animals. The jeep safari is better done in the evening, 4.30-6.30pm. Sambit Bal lives under the delusion that he will one day summon up courage to give up editing Cricinfo.com and take up residence in the wild.